It's all been about a certain other Singleplayer RPG Franchise turned MMO property this week, but whilst everyone else has been off in Tamriel I spent a weekend with the beta for the upcoming PS4 release of Final Fantasy XIV. Does a love for this fanservice-laden MMO hold up when controlled with a gamepad rather than Keyboard and mouse? Characters in this final Beta weekend will transfer over into the PS4 release of the game (and thus, also be accessible on PC and PS3), so rather than return to my PC character, I started afresh on Taroro Taro, a Lalafellin Arcanist. 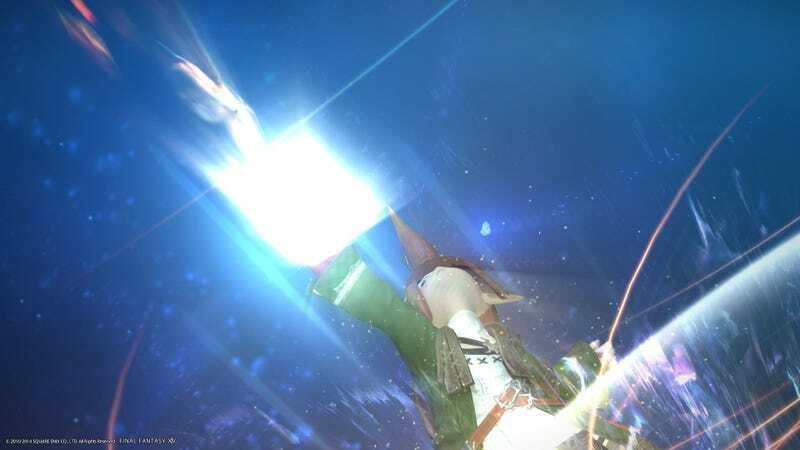 When ARR released for PC last year I spent my time with the game as a Dragoon, a melee role, so it was interesting coming back to the game and trying it as not only ranged, but as a caster someone who had to stay rooted during cast times. Turns out, it's pretty handy in this AoE-laden combat system to be far enough away that you're mostly always standing outside its deadly effect. But the first thing that you can see about FFXIV on the PS4 is that, whilst it doesn't scream next-gen like Killzone or Infamous, it's still a good looking game. I couldn't tell a difference between this client and it running at max settings at 1080 on my PC last year, other than one advantage in the PS4's favour - the game runs at 60fps a good chunk of time (not when there's a ton of characters on screen, or their spell effects, but there's rarely huge dips), something I couldn't manage on my ageing PC hardware. So FFXIV still remains a really good looking MMO, even on console. For the first time PS4 Beta testers were unleashed on the actual game servers rather than test servers, so there were plenty of folks around, from beginners to... these guys. I've been away from the game for long enough that I have no idea what's going on here. Why does that Chocobo have a black mage's hat? Is that guy Floating on an Ahriman!? With a new character on an unfamiliar platform, it was a little confusing seeing max-level characters everywhere. Fast forwarding a little, Taroro hit the mid-teens in her levelling quest, giving her access to dungeons and challenging group content for the first time (also, as seen above, AN ADORABLE PUPPY COMPANION). As a DPS, and despite the influx of new players, this meant waiting in group finder queues. A lot of waiting in group finder queues. I didn't mind though, because it gave me time to think about the way FFXIV has been adapted to work on a controller. As a long-term MMO player, at first I was extremely sceptical that the complexity of an MMO couldn't be mapped to so few buttons. And at first, I felt vindicated - controlling my character and starting to enter combat with multiple targets at first overwhelmed me, feeling overwrought and clumsy compared to the deftness at which I would operate with the keyboard and mouse, but eventually it clicked, and I adapted, but I still feared it would all come apart in the game's group content, which demanded deft control as much as it did concentration. I need not have worried. The PS4's 'Cross Hotbar' solution, which gives you two sets of hotbars based on the hotkeys for the face and d-pad buttons each accessible by holding down a different trigger (so 16 buttons on demand in total), and given the game's universal cooldown timer of 1.5 seconds - quite slow paced in the world of MMOs these days - in the heat of group content it almost became like playing a rhythm game, tapping out a beat of spells in my rotation on one trigger, then switching over to the other to perform healing spells and pet management. Admittedly, I'm still in early days and don't even have enough abilities to fill my hotbars yet, but still, the Dualshock 4 survived the rigours of dungeoneering surprisingly well - hell, it survived one dungeon where I ended up healing (I have one, bad heal spell), DPSing and off-tanking with my pet - to the point I started the weekend totally dismayed with the controls, only to finish it loving them. I think the only thing I'm going to change is to scale down the UI a little. The Crossbar setup takes up a good deal of screen retail, and with a big TV hooked up to my PS4, I can afford to scale down the size of the UI elements a little more compared to the default layout. So FFXIV remains a solid, fun MMO, and in its PS4 version, offers a thoroughly well done port for console players to try out (which I most definitely will, having cancelled my WoW sub waiting for Warlords of Draenor to come out). It looks great, runs great, and most importantly still plays great, even with the limitation of a controller input. I ended the beta at the Level cap of 20 for my Arcanist, so as one final set up for release I switched over to the Thaumaturge class and headed to the nearest Inn, so when the game hits I can level that up quickly via rested experience (delicious, delicious rested experience) and hit the requirements for the Summoner job. Good night, Taroro Taro. I'll see you in week, when A Realm Reborn's PS4 edition hits stores on April 14th.